As addictive as business week (a big timewaste) or gmatclub mba forums have been during the application process, I guess its time to move on to the next part. After putting months into figuring out the right career objective statements etc and then getting the final admit, I am more interested in reading what current students have to say – to figure out what mistakes not to make. And thus I came across this genuinely insightful post from Orlando. My Dad says your value doesn’t depend as much on what you do as it does on how well you do whatever it is that you do. Going an extra step and paying attention to details start becoming increasingly important. 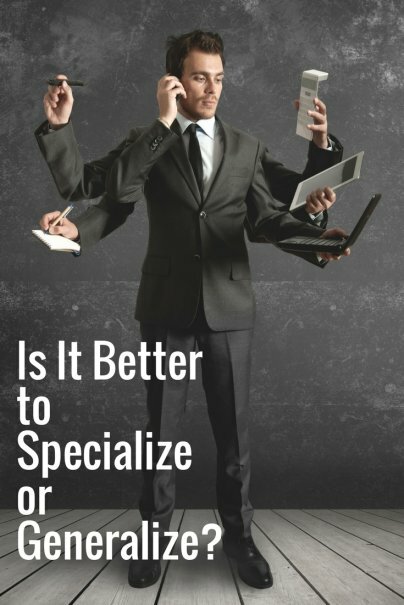 It also raises a important concern – how much specialization should I aim for? It becomes a trade off between playing safe and showing extra confidence in yourself. Going back to Class XI, I took both Biology and Mathematics because I wanted to keep both options open (Indians would understand). By some luck and extra effort, I cracked both Medical and Engineering entrance exams in India. But at this point, I had to make a choice. Now lets see, what did I gain – ability to hedge my position (a backup which makes me laugh now, I was backing up my option to be a doctor by another to become an engineer! I know how ridiculous it sounds now. These streams are world apart, one shouldn’t just become a doctor because he couldn’t be an engineer and vice versa. But forgive me for rambling, that is the issue with Indian society and education system, I’ll save it for some other post.) What did I lose? – I could have cracked a better exam if I had focused on only one stream. And I know whole ‘entrance exam’ mania in India is also crazy but just a point that if I was focused enough, I could have gone to a better college. Why am I wondering now? All the major B schools provide specializations for MBA. Stern allows up to 3, same for Kellogg and so on. Even if you don’t target specialization per se, I am talking about taking electives. Obviously there are limited electives you can take, so how would you want to spread it out? I was talking to a Media professional who is an MBA and very very interested in sports like me. He said sports management is such a niche field that even if the school provided it as a major, he wouldn’t have taken it. Thankfully Media Management has outgrown that size and is more of a mainstream option now. It is my intended field of specialization as of now. But for others, I am not so sure. Is it better to combine it with marketing or consulting etc etc. How do employers view your electives? What is the criteria for initial interview selection? How does it impact overall job hunt? Will a marketing company be reluctant to hire you if you didn’t specialize in Marketing but only took few electives? For eg. there is a course called Corporate Finance in Media and a generic Corporate Finance course. By taking the former, I might be more lucrative to a Media employer (will I be?) but I might miss out on other firms? I am just wondering whats the best approach and I understand it will be subjective. So, any ‘lessons learned’ or comments from existing students would be awesome. Also, whats the take of other applicants. Sometimes, the jack can outweigh the master.